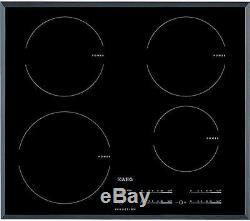 AEG OptiHeat HK654200FB Electric Induction Hob - Black. Kitchen Appliances > Built-in Appliances > Built-in Electric hobs. Brand new & pristine product. Top features: - OptiHeat control for efficient cooking - Precise controls and control lock - Perfectly timed food with the included timers OptiHeat Control One of the quickest and most efficient ways to cook, induction cooking heats the pan and nothing else, so you spend less time cooking and help reduce your energy bill. The HK654200FB offers extra efficiency thanks to the OptiHeat Control which tracks the level of residual heat for each zone it will let you know if the zone is still hot enough to cook with or keep food warm. Precise control Sensitive touch controls let you select the precise level you need for the best results, whether that's a low, gentle simmer for a pan of milk or an intense heat for pan-searing steak. Because it's induction, you'll notice the change in temperature immediately, meaning less time and energy is wasted. For safety in the kitchen, the HK654200FB features a control lock, which can be used to prevent young children turning on the controls or adjusting the controls during cooking. Perfectly timed Time your dishes perfectly thanks to the built-in minute minder and clear LED display, or alternatively use the CountUp Timer which starts at zero and keeps counting until you stop it to monitor how long dishes have been cooking. ___________________________________________ ELECTRICAL INSTALLATION: This product requires professional installation to a dedicated cooker circuit (identified by a big red cooker switch) by a qualified installer, such as one of our Team Knowhow experts. All Currys/PC World Outlet guarantees are non-transferable. Type: Built-in electric induction hob. Hob power: Front right: 1.4 kW with 2.5 kW boost, Front left: 2.3 kW with 3.7 kW boost, Back right: 1.8 kW with 2.8 kW boost, Back left: 1.8 kW with 2.8 kW boost. Safety features: Child safety control lock, Auto safety switch off. Other features: OptiHeat control: monitors residual heat, Automax function: automatically reduces heat to preset power level after boiling, Stop+Go function with keep warm setting. Installation: Please note this product needs to be installed by a qualified engineer, such as one of our Knowhow experts. Minimum distance required / Minimum clearance above hob: 500 mm above, 50 mm to sides. Box contents: AEG OptiHeat HK654200FB Electric Induction Hob. Dimensions: 55 x 590 x 520 mm (H x W x D). Recess dimensions: 55 x 560 x 490 mm (H x W x D). This product has no reviews yet, however see what our buyers say about our other products.. Small box electricals like computers, tablets, camera's, small kitchen appliances. We deliver within the UK only. We don't post to Channel Islands or Internationally. Warehouse/store pick-ups are not available. For more information, read on.. Courier selection is standard and will depend upon value and/or weight/dimensions of the product. Express: DPD - for safe, secure, signed-for deliveries to your door. This includes Northern Ireland and the Isle of Man. We do not accept orders to PO Box addresses and International orders, including those from the Republic of Ireland, the Scottish Highlands and the Channel Islands. Orders for large domestic appliances are accepted to all mainland UK addresses (including Northern Ireland) and the following islands: Isle of Skye, Isle of Sheppey, Anglesey, the Isle of Wight, and the Isle of Man. This excludes the Channel Islands and BFPO. To create your return label. Unopened - in an as new condition - unused, without installation or data input - in the same condition as supplied to you - complete with any accessories and free gifts offered with it - with the original box and unopened packaging. Unwanted products cannot be accepted after 30 days if any of the above criteria are not met. The right of cancellation does not apply in the following circumstances. When the product seal has been broken on any DVDs, CDs, memory cards or software, including games - On any personal hygiene products such as shavers, hair care products - On headphones, where the seal on the packaging is broken - If you want to return a Software Product Activation Key card which is not faulty, the silver strip on the back of the card must be fully intact as new. Complete the Reason for Return note that came with your parcel & include it in the parcel with your return. Take your parcel into any Post Office. To find your nearest Post Office. Remember to ask for a proof of return receipt from your Post Office as this will act as proof of posting should the parcel go astray. Failure to obtain this may prevent us from refunding you if your return is not received by us. Your return can be tracked using the tracking reference from your proof of return receipt by clicking Track My Return. Please note - we do not stock spare parts, and are unable to send replacement parts. You received an incorrect item - you received a damaged item - you received a faulty item. Can a Currys or PC World retail store help? Reassuring 12 month guarantee on all products. The item "AEG OptiHeat HK654200FB Electric Induction Hob Black" is in sale since Monday, May 22, 2017. This item is in the category "Home, Furniture & DIY\Appliances\Cookers, Ovens & Hobs\Hobs". The seller is "currys_pcworld" and is located in Newark. This item can be shipped to United Kingdom.